Becker Village Mall released their own Roanoke Valley Rockfish! Local artist Heather Rhea represented the rapids in soft hues of blue and green and in pointillism (like the impressionists) to give the fish a unique look. She added some glitter, so that areas of the water seem to glisten. Rhea is originally from Roanoke Rapids, works full-time as a graphic artist for The Daily Herald and has been painting murals and faux finishes for 15 years. 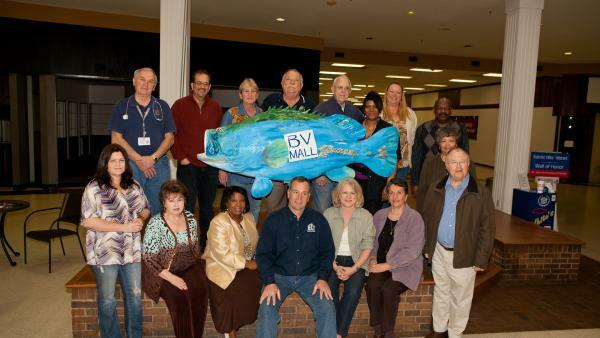 The BVM fish is on a movable stand, and is featured in various locations in the mall during special events. Becker Village Mall has been rocking the Roanoke Valley for thirty years. The mall is host to a wide variety of shops and services. You can keep up with the mall stores, including new openings, and events at the mall on www.beckervillagemall.com and follow them on Facebook.